San Diego State’s running back Rashaad Penny put a stop to the Aztecs‘ two-game losing streak by lifting the team to victory over Hawaii on Saturday at Aloha Stadium. And so it seems, SDSU left all the bad energy behind. 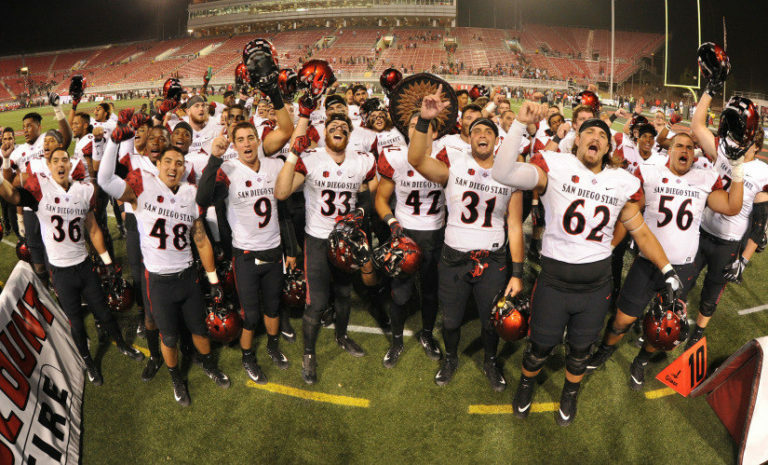 The Aztecs (7-2, 3-2 Mountain West) limited the Rainbow Warriors (3-5, 1-4) to 35 rushing yards and 195 total yards. It was only the second time since 1999 that a team limited Hawaii to under 200 total yards. The Aztecs also got a little help from UNLV. At halftime, news broke that the Rebels had upset the Fresno State Bulldogs, cracking the door for SDSU to still be in the race for the Mountain West’s West division title. The Bulldogs (5-3, 4-1) still hold the tie-breaker, so the Aztecs still have some work left to do. SDSU will close with a road game against San Jose State, followed by a bye week and then two home games agaist Nevada and New Mexico, both of which have losing records. The Aztecs will need to win all of their remaining games to stay in the running for the division title. The Bulldogs, meanwhile, have two tough opponents at the end of the season, Wyoming (5-3) and Boise State (5-2). Fresno State will need to lose two of its three remaining conference games for SDSU to reach the Mountain West Championship Game for the third straight season.